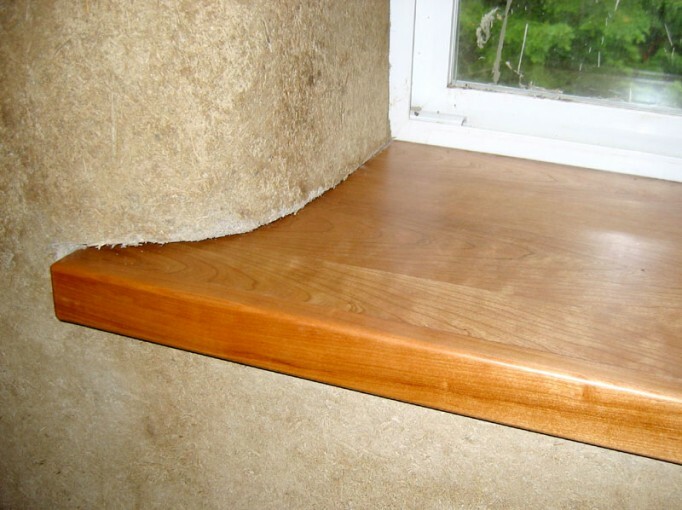 The deep window sills are one of the attractive features of straw bale building. The walls are as thick as the straw bales, and the window is mounted flush with the outside of the wall to prevent rain or snow from damaging the plaster below the window. Crafting a beautiful deep window sill from either wood, tile, or plaster creates a space for sitting, leaning out to admire the view, or decorating with photos or plants. This window sill is made from plywood with North American cherry veneer, and the nosing of the sill is a piece of cherry hardwood, attached to the plywood with a biscuit joiner. The combination of plywood veneer with hardwood was chosen because using a full piece of hardwood may result in cupping of the wood with the significant variations in humidity that are common in this climate. The owner wanted a naturally red coloured wood without having to import hardwood from exotic countries. With UV exposure, this cherry wood will deepen to a rich red over time and contrast beautifully with the tones of the fir timber frame and pine ceiling. The sill was installed after the plaster was dry, and now the base of the window opening plaster needs to be touched up to join perfectly with the sill. Then the colour alis coat can be applied to the plaster walls.